According to a recent survey conducted by Capital One, more than half (52 percent) of security industry professionals see video surveillance as the technology trend that will have the biggest impact on their businesses in the coming years. That’s a significant increase from 2015 when only 23 percent of respondents answered similarly. The growth of interconnected devices (the Internet of Things) was cited as the next most significant trend at 28 percent. The survey was conducted at the Honeywell Connect conference held in Florida earlier this month and included 123 responses from a combination of dealers, integrators and other industry professionals. Video surveillance continues to grow in the United States and worldwide according to a recent article on MarketWatch. Software component and service segment is expected to lead the video surveillance market. The market for the service segment is expected to grow at the highest CAGR between 2016 and 2022. Cloud services and video surveillance as a service (VSaaS) play an important role in the video surveillance system. Software components include video analytics and video management software. Also, the use of neural networks and algorithms in the biometric surveillance system is a part of software component. The advancement in software technologies and networking services would lead the video surveillance market. A recent article in Security Sales and Integration shares the story of Ogden, Utah that is reducing crime with video surveillance cameras. Surveillance cameras installed downtown approximately six months ago have reduced crime, Odgen Police have found, much to the delight of business owners. 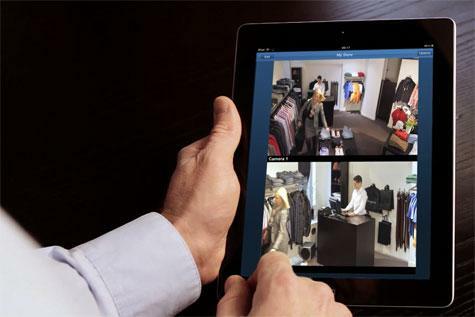 A recent article on IFSEC Global compares the video surveillance market to the smartphone market. Mr. Rajput, the author, spent 15 years at Axis and has been asked many times to explain the difference between analogue and IP surveillance. Trying to come up with an elevator pitch for IP cameras is difficult because of the breadth of application use cases available, from conventional security and surveillance to a more recent trend toward business optimization. In fact, the use cases would likely vary wildly, depending on whom I’m pitching. An installer would want something different from the end user, and a retailer would want something different from a security manager responsible for critical infrastructure. For this reason, I often use the analogy of mobile phone technology. Today’s mobile phones aren’t really phones, and the tablet revolution started long before the iPad. It started when we all began carrying smartphones. The exponential growth in the use of these devices reflects customer demand shifting from analogue to digital technology. There are uncanny parallels to be drawn with the rapid growth of the IP surveillance market. Customers are readily embracing the shift from analogue to digital network cameras. Just as smartphone users experience HD-quality video and share content seamlessly with friends, end users are becoming more tech savvy and demanding that surveillance keep pace with the rest of consumer technology. Why can they get HD images on a phone camera but not on a surveillance camera? And why can they make live video calls on a smartphone but not get live video feeds from a security system anytime, anywhere? To read the full article. This following article by Jason Knott was posted on CE PRO today. The article recaps a Home Technology Specialists of America panel and focuses on integrator opportunities for those who embrace the cloud. Ryan Strange, CEO of ControlByNet, has been focusing on the switch to IP video surveillance for several years, stressing to integrators that security surveillance belongs in the cloud. Read excerpts below. There’s been a lot of discussion about disruptive technologies, disruptive business models and the cloud lately, but according to industry watchers, it’s only the beginning. Instead of fearing these technology shifts, integrators should embrace them as huge opportunities. “The more confusion there is amongst consumers, the bigger the opportunity for integrators to become the go-to specialists,” said Bob Hana, executive director of the Home Technology Specialists of America (HTSA), during the buying group’s Fall Conference in Chicago. You are currently browsing the archives for the Video Surveillance Industry News category.